The South Korean tech giant, Samsung India Electronics has released Galaxy J7 Prime with a 5.5-inch display screen. The all new Samsung Galaxy J7 Prime is priced at Rs. 18,790. With the launch of Samsung Galaxy J7 Prime, the company has expanded the J series portfolio. As the Galaxy J series has received an enormous response from people and now the company taking forward its legacy with the brand new Galaxy J7 Prime. The smartphone sports a 5.5-inch full HD IPS display along with 1080 x 1920 pixels resolution. And this latest smartphone is powered by a processor with 1.6GHz octa-core power. The J7 Prime comes with a metal unibody alongside a 2.5D Gorilla Glass. The new Samsung Galaxy smartphone features a 3GB RAM and a 16GB of inbuilt memory, which can also be expanded up to 256GB by using a microSD card. When considering the camera specifications, the phone features a 13MP rear camera along with the 8GB front camera for taking beautiful selfies, and both the cameras are bundled with f1.9 aperture. Furthermore, the Galaxy J7 Prime features a non-removable 3300mAh battery and the device runs on Android 6.0 Marshmallow. The smartphone is a dual SIM (GSM + GSM) device that comes with two Micro-SIM. As for the connectivity options, the Samsung Galaxy J7 Prime includes a GPS, Wi-Fi , 3G, 4G (which supports Band 40 as used by some LTE networks in India), and Bluetooth. While the sensors include an Ambient light sensor, Proximity sensor, Gyroscope, and Accelerometer. The company is touting few features in the Galaxy J7 Prime like S Power Planning (which is a reserve battery technology that helps when the battery is getting low) and S Secure (helps users to lock or hide apps, and more). 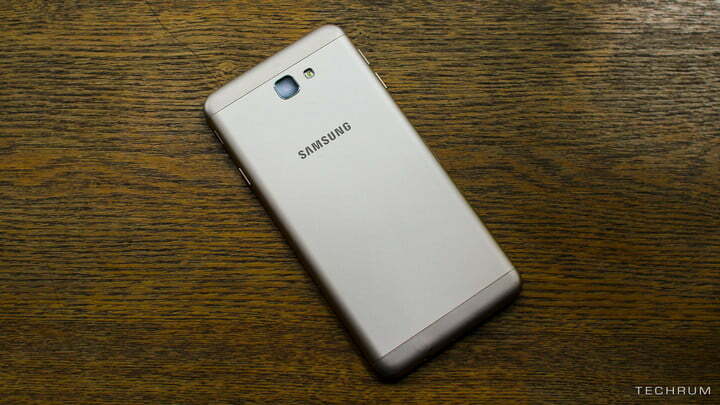 The Samsung Galaxy J7 Prime measures 151.50 x 74.90 x 8.10mm. And it is currently available in the market and with a price point of Rs. 18,790 it is giving the consumers a choice of color with Gold and Black. The device has just been announced, so we will wish to wait to see a detailed Samsung Galaxy J7 Prime review to get more detailed insight about the device.